I love that quote because as happy as I was to finally be pregnant, boy was I in for a shock during that first trimester! Oh, morning sickness (Or… if you’re anything like me, ALL DAY sickness). I really don’t think anything could have possibly prepared me for the three months of throwing up and nausea that I experienced. My husband and I tried to conceive naturally for over a year and eventually got pregnant on our first cycle at a fertility center here in Utah. We were so excited to finally be parents. At about 6 weeks into my pregnancy, my nausea first kicked in. I thought, “alright, here we go! This is all part of the process!” I knew I’d get sick, and I knew I’d probably throw up. I guess I must’ve thought it would come and go instead of actually throwing up 2-4 times a day and feeling like I’d throw up the rest of the day, 24/7 for 3 months. My husband had just started a new job and I was too sick to go to work myself. Day after day I worried over little things like how I would get out of bed to make something to eat or if I’d be able to take a shower without throwing up. I’d bribe my sister weekly to come over and help make meals. After a month and half of this, I remember sitting out on our front porch and feeling so alone and depressed that I couldn’t take care of myself or be a “good wife”. I couldn’t go to work, go grocery shopping, make meals, or clean the house. Before I got pregnant I had always felt like a pretty independent person, and I really struggled having to rely on other people for what seemed like such menial things. I kept telling myself, “other woman have it worse” or “at least I’m not in the hospital on IV’s” but these thoughts only made me feel weaker that I was struggling so much. I felt like I wasn’t being grateful enough for finally being pregnant or that I wasn’t as strong as the other woman out there who seemed to handle pregnancy really well. My hope is that this post doesn’t come across too negative but instead helps woman who are going through the same thing and feeling similar feelings. During my first trimester I read article after article of ways to ease the nausea but eventually all I really wanted was an article or website where I could read of other women who were struggling just as much as I was. I needed advice on how to handle it emotionally. I felt like I couldn’t relate with any of my pregnant friends because they weren’t as sick or at least they seemed to handle it all with a skip in their walk and a sparkle in their eye. It’s so easy to feel discouraged when you feel so sick and weak for what seems like forever. ESPECIALLY if it’s your first time around, not knowing when it will end. You hear horror stories of woman who throw up their entire pregnancy or of the first one being the longest and hardest. I remember talking with my pregnant sister-in-law when I was ten weeks and her telling me she was finally coming out of the sick stage in her second trimester. This of course made me want to break down and bawl my eyes out. My tenth week was the hardest for me emotionally because I’d just endured a month of throwing up and dealing with constant nausea. I couldn’t see myself being strong enough to endure another month (or more). 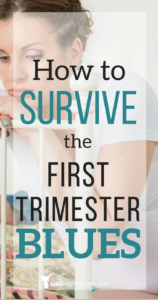 Because I struggled so much physically and emotionally during my first trimester, I thought I would offer 5 suggestions of how to get through those first trimester blues. 6 Things to help you survive the first trimester blues!! #1 Remember that you’re strong!! I put this as number 1 because I think for all of the first timers out there, that had no idea what to expect out of pregnancy, it’s easy to get discouraged and feel like you aren’t cut out for this like other woman are. You have to remember that every one experiences it differently. Some woman don’t get sick at all or only feel nauseous every once in a while while others deal with constant nausea and/or throwing up. Just because your friend is able to work full time while pregnant and your biggest accomplishment is showering every 3 days does not mean she’s stronger than you or can handle being pregnant better than you. It’s simply not true. You are both experiencing pregnancy differently and there is nothing wrong with that on either end. Have I mentioned yet how incredible lonely I was that first trimester? I felt like I was put on bed rest by my own body. I couldn’t work and driving anywhere only made me more sick. My husband worked late every evening and I found myself craving social interactions. If you’re home bound like I was or if you begin to feel lonely as well, get people over to visit! Fortunately for me, I have a large family so I would invite one person over every couple of days just to sit and chat or watch a movie with me. It’s pathetic advise, I know. But I’ll be honest, I think I watched What to Expect When You’re Expecting twice and every season of Burn Notice and Drop Dead Diva as well. Whatever I could find that would distract me from that awful feeling of needing to throw up, I was all in. Find what that is for you. Whether it’s a good book, visitors, movies, TV shows, blogging, or going to work, I say do it! Anything is better than just sitting there, feeling sick and alone. If anyone calls you lazy, ignore it. It’s not like this is a 24 hour flu! Be as productive as you possibly can when you feel good and when you don’t feel good, do what works best for you to keep the food and fluids down. #4 Don’t be afraid to ask your doctors for help! Around that tenth week, I couldn’t take it anymore. I needed to be able to get out of my bed, back to my job, and back to being a good wife. I had an appointment coming up and I was determined to ask for something to help the nausea. None of my natural methods seemed to help and though I hated hated haated the idea of resorting to a prescription I couldn’t take it any longer. I was causing my body so much stress and I laid in bed all day to keep fluids down so I wouldn’t end up on IV’s. I went into my doctor and in the middle of telling him how awful I was feeling he kept saying things like,”great!”, “that’s what we like to hear”, or “ya some woman have to be put on IV’s and that’s normal too”. I watched my courage fly right out the window and decided I wouldn’t continue “complaining” or ask for anything because apparently, even if I was hospitalized this was all normal and I just needed to buck up and handle this on my own. I felt so discouraged all over again. Let me reiterate my #1 point in that you are not weak if you decide you need Zofran, Diclegis, or some other prescription meant to help ease morning sickness. Why else would they have created medicine meant specifically to help pregnant woman with their nausea and vomiting? I think my doctor meant well and he probably would have easily prescribed me something had I asked but instead, I let discouragement and comparison get the best of me and I endured through the rest of my first trimester in bed. Don’t be like me in this case! Talk to your doctor and see what all is available and safe if you’re feeling like you need something to help you function again. Hopefully you find something that works! #5 Take a deep breath! Oh goodness, I can’t tell you how many times my sisters told this to me. I worried over everything. If you’re reading article after article about all the things you should be taking and its making you discouraged because you can’t keep any of it down, maybe chill with all that research and take a deep breath for a second. I couldn’t keep my pre-natals down ever, or any pill for that matter (Vitamin D, Magnesium, etc…). I also couldn’t stomach any seemingly healthy foods because my appetite was so limited. For some reason Mac & Cheese (ya… the boxed stuff) always sat well with my stomach and so my husband bought it in bulk and I think I ate it close to every day (lets make this a judge free zone ladies…). I really hated water because it didn’t always sit well but I tried to sip it as much as I could and drank watered down Gatorade. Of course I then was constantly worrying that my baby wasn’t getting the nutrients it needed and that it would be all my fault if something horrible happened because I wasn’t eating “healthy”. I voiced my concerns to my doctor, and many other woman, and was told over and over again that this was totally normal in the first trimester. It was more important that I kept whatever I could down (especially fluids!) and worry about the other stuff when I felt better. The baby will pull whatever nutrients it needs from you. Take a deep breath and if you’re feeling really anxious about what you should and shouldn’t be eating/drinking, call in and talk to your nurse or doctor about it! #6 There is a light at the end of the tunnel! You have a beautiful human being growing inside of you! Your sacrifice is going to be well worth it in the end when you’re holding that little bundle of joy. Since I never knew when my morning sickness would subside, I would sometimes try to take it all just one day at a time. I found that if I was constantly thinking about how far away my second trimester was or how long the pregnancy would be, I would start feeling disheartened or hopeless. Try to stay in the present and find a positive light to every hard moment. Keep your chin up, you can do this and you’re going to be an awesome Mom!! If you have more suggestions to add to the list, that helped you through your own pregnancy blues, please comment them below! I know I personally would have loved to read other women’s advise during this emotional roller coaster. Also, I found this man’s perspective of understanding morning sickness really funny and totally spot on. If you have the time, it’s definitely worth the read!